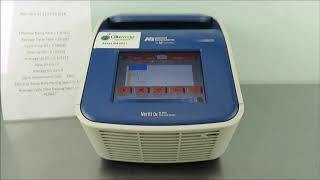 The ABI Veriti DX 96 Well Thermal Cycler is easy to set up and simple to use, for precise and reliable amplification of nucleic acid. The Veriti Dx 96 designed by Applied Biosystems features an intuitive color touch screen controller used for easy instrument setup, with two options for method navigation. Users can either choose from preprogrammed run methods or program their own. After creation, users of this PCR thermal cycler can then create a shortcut for quick access or store the program to the system or a USB instrument for later use. The Veriti 96 well thermal cycler comes with VeriFlex blocks allowing you to run six independent temperature blocks giving the user precision controls over the PCR system. By allowing each block to be set a specific temperature, users can also run more experiments at once. The ABI Veriti DX 96 Well Thermal Cycler allows users to export information quickly and easily through a USB port, letting you store an unlimited number of methods, or transfer methods from system to system for fast set up. This PCR system is classified as a US FDA Class I Medical Device for in vitro diagnostic use and conforms to IVDD requirements. This ABI Veriti Dx 96 Thermal Cycler has been fully inspected and is ready to ship. All of our lab equipment comes backed with ours standard warranty. Should you have any questions, please don't hesitate to contact us.